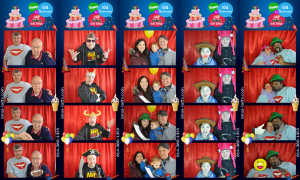 Lotsa Laffs Photo Booths at Todd’s Birthday Party! 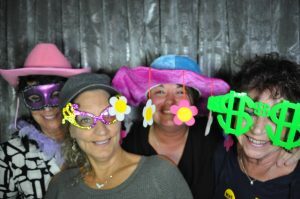 Lotsa Laffs Photo Booths celebrated Todd’s 50th birthday on Saturday, November 11th. His wife, Tammy was the awesome person that planned the event at the Veterans of Foreign Wars, Mifflinburg. Todd thought the family was going out to dinner to celebrate this big event, but he didn’t expect to see the guests, Lotsa Laffs Photo Booths and a DJ screaming “Happy Birthday Todd!” when he walked in the room. 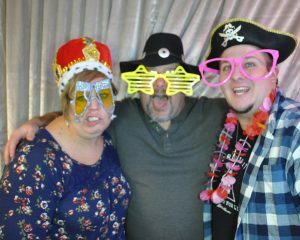 Everyone had fun posing for a picture with their favorite birthday boy, Todd, and the awesome Lotsa Laffs Photo Booths birthday props. No matter the age, everyone was laffing while trying on the wide selection of hats, boas, masks, props and glasses before standing in front of the camera for a picture. We had a hilarious time seeing the guests do some crazy stunts in front of the camera. 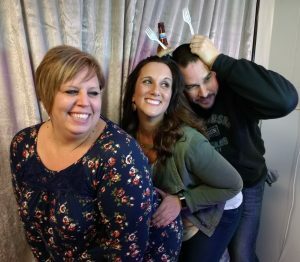 Todd, Tammy and guests were still partying and having Karaoke fun when Lotsa Laffs Photo Booths said goodbye to the birthday boy. At 50, you can still do what any 21 year old can do Todd: dance all night, sing off key at a Karaoke bar, gather around friends, squish tight and mug for the camera and especially eat and drink like a king. Happy 50th Birthday Todd and many happy returns! That’s Birthday Boy, Todd, In The Middle! What Is It Exactly That We Are Doing? 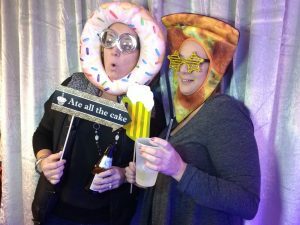 Lotsa Laffs Photo Booths at Allison’s Birthday Bash! Lotsa Laffs Photo Booths celebrated Allison’s birthday on Saturday, October 21st. Her husband, Kyle, was the awesome person that planned the event at the Sons of Italy, Williamsport, PA. Allison thought she was going to watch the Penn State Michigan game with her in-laws and husband, but she didn’t expect to see the guests, Lotsa Laffs Photo Booths and DJ screaming “Happy Birthday Allison!” when she walked in the room. Kyle, Allison and her in-laws are big Michigan football fans. 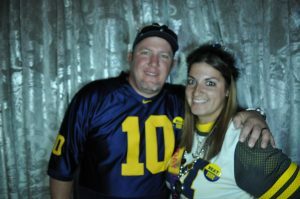 Allison was even wearing a button stating “Beat Penn State” while Kyle and his parents were wearing Michigan jerseys. 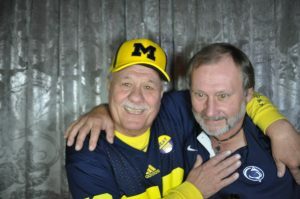 Allison’s father-in-law and his friend, a Penn State fan, showed their rivalry while mugging for the camera at the photo booth (see photo below). 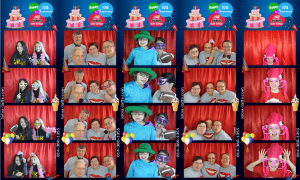 Everyone had fun posing for a picture with their favorite birthday girl, Allison, and the awesome Lotsa Laffs Photo Booths birthday props. Allison, Kyle and guests were still partying, having fun and ready to watch the battle between Michigan and Penn State when Lotsa Laffs Photo Booths said goodbye to the birthday girl. The following week was her actual birthday, and she was amazed that her great husband was able to surprise her with this party. After a hug from Allison and Kyle, Lotsa Laffs Photo Booths was on their way back to Penn State territory listening to the progress of the game. Time To Celebrate My Birthday!!! Who’s Gonna Win The Big Game Tonight?